Jacquie Stewart (third from right), Business Liaison for ALSTAR EMS, joins members of the Marie Barone Memorial Women’s Golf Tournament Planning Committee (left to right: Christine Yocum, JoAnn DeMarco, Susan Melquist, Patty Hurtack, Kathy McMaster and Katie Bell) to announce details for the 20th annual tournament at South Hills Country Club on Monday, June 30th. 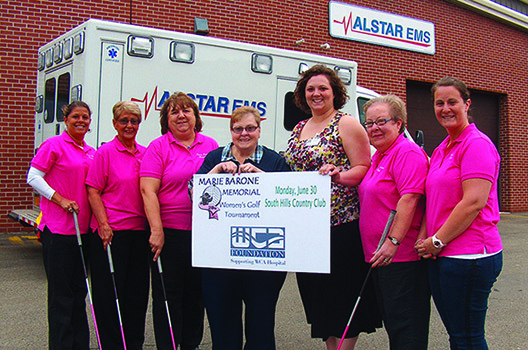 2014 is a milestone year for the Marie Barone Memorial Women’s Golf Tournament as it celebrates its 20th anniversary. The committee, comprised of Barone family members and friends, has announced that sponsorships and registrations are now being accepted for this women’s only tournament which will be held on Monday, June 30th at South Hills Country Club in Jamestown. Since 1995, nearly $130,000 has been raised by this annual tournament, including a record $13,000 in 2013. For the fourth year in a row, all of the proceeds from this charity golf tournament will grow the Marie Barone Memorial Fund, an endowment fund at the WCA Foundation which will be utilized to assist in the diagnosis, care, and treatment of local female cancer patients at WCA Hospital. The Committee also announced the return of ALSTAR EMS as the event’s Major Sponsor. Highly-qualified ALSTAR EMS emergency response professionals now respond to more than 17,000 calls per year from ambulance bases in both Jamestown and Dunkirk. To learn more, visit www.ALSTAREMS.com. For more information regarding the Marie Barone Memorial Women’s Golf Tournament, including available sponsorships and golf registrations, please contact Patty (Barone) Hurtack, Tournament Chair, at (716) 488-0580 or phurtack@gmail.com or visit www.wcahospital.org. Marie Barone was active – very active! She was an energetic mother, sister, bowler, and golfer, while working full-time. Marie was the last person you would think would be at risk for cancer. Tragically, Marie passed away at the age of forty-five after a courageous battle with colon cancer. Despite the challenging circumstances, she remained upbeat and optimistic throughout her illness. To make a gift to support the growth of the Marie Barone Memorial Fund, please make checks payable to: WCA Foundation, and mail your tax-deductible gift to: P.O. Box 840, Jamestown, New York 14702-0840. If you have an interest in creating an endowment fund of your own, please contact Karl Sisson, WCA Director of Development, at (716) 664-8423 or karl.sisson@wcahospital.org.